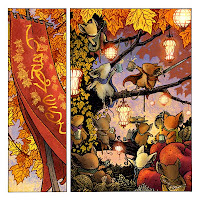 I was asked by Cross Cult, the German publisher of Mouse Guard, to do a new print to be inserted in their upcoming limited hardcover of Fall 1152 (or Herbst 1152 as they say.) I left the text out of the banner so that I could digitally add it to be either in English 'Harvest' or German 'Ernte'. Here is the image in English. I was inspired by the peasant paintings of Pieter Bruegel the elder, a few scenes from Disney's Alice, and the scenes of Bilbo's birthday from both the Bakshi & Jackson versions of LotR. I recently spoke at Kendall in Grand Rapids, MI as a guest of the digital illustration department. The turnout was good and the students seemed to enjoy what I had to say. I talked about artistic process, things to do to promote yourself, the business side of making artwork for a living, and technique. It was a pleasure to talk to students who are really invested in making their artwork a career focus. So, a big Thank you to the Digital Art Department for having me out and the students who attended for a good round of Q&A. This story came up at the Kendall talk, and I figured I would share how Conrad came to be. 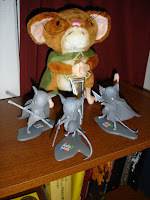 Guy Davis had seen the Mouse Guard figurines even before Mouse Guard was a book. He asked me at every Motor City show I brought them to "Will you sell them"? I always said "No". My thinking was that if I sold my Saxon or Lieam, I'd never be able to sculpt another that I would like as well as the first one. 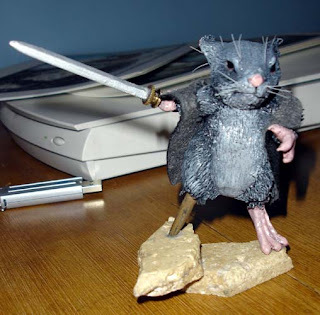 Then it hit me, I'd sculpt a mouse just for Guy (who was very supportive Mouse Guard getting off the ground). This mouse would be a nobody. Not a character from my book, just a generic mouse that I wouldn't have the attachment issue with. The night I started sculpting it, I wasn't having much luck. I had started using Super Sculpy instead of the regular stuff I was used to. Among other problems, I couldn't shape two feet that matched. Frustrated, I picked up a watercolor brush with all the paint chipped off the handle and snapped it. I took the short end of the handle and crammed it up in the mouse's leg socket thinking "now I only have to sculpt one leg"! Then I ripped his ear, and added an earring (really a loop for stained glass suncatchers) By the time I was handing the mouse off to Guy, I knew it had to be a character in Mouse Guard. So I asked Guy "What's his name"? Guy said "We will let Rosie (his fiancée) pick, I'd just come up with something dumb like Conrad" Rosie did come up with a name, but I was already attached to Conrad, so I used her suggestion "Calogero" as the outpost home he lived in. I am terribly sorry to have not been posting more regularly here. 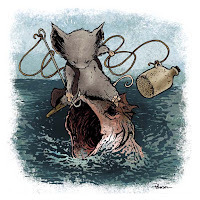 Convention season caught up with me (among other household duties, projects, colds, etc...) and I was trying to get out from under the past-due deadline that is Mouse Guard. With that in mind, please excuse Issue 2 of Winter's lateness. After getting a dresser out of my office, that was left from when my sister-in-law was staying with us, I was able to finally put up two new sets of shelves. We had an electrician out to hook up a 220volt outlet for the stove, and I used the time he needed the power off to get these shelves assembled. 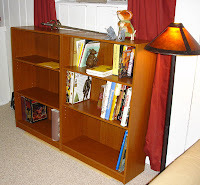 My old shelf was so full, I couldn't fit anything on them and had a stack of books sitting on the top and on the floor in front of them, so while these two new shelves look empty, just think of all that as overflow around the old shelves. You may notice on top of the shelves is a Lieam Plush!! aaaaand the grey Retailer-only PVC Mouse Guard set. Diamond was cool enough to send these along to me (The Lieam just arrived today) and It's very very cool to have the merchandise be stuff you would want to own. Our dog Autumn has already tried to snag the redfurred mouse out of my hands twice as her new chew toy, so hopefully now that he is up on a shelf, she will behave. According to Diamond's website the Lieam plush is due out late November. The PVC set (in color) I am still waiting on word about. 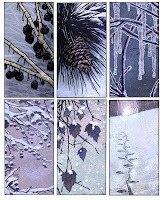 I decided that the inside front cover of the winter series issues would be small nature panels. I enjoy doing them and wanted the landscape and season to really be a character in this series. 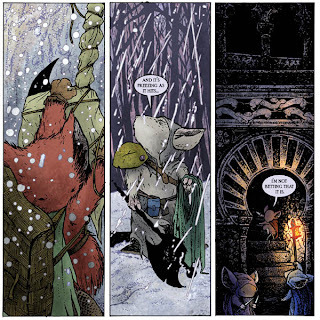 So instead of doing a spot illustration of a mouse character each time, I'm doing a few panels to get the readers mind into the winter character. I recently finished all the remaining panels and Julia and I are thinking of using them as our Christmas Cards. At the weekly Art Night group I attend, I did a few non-Mouse Guard pieces between pages to keep things fresh. after reading Rocketo for the first time a few weeks ago, I knew it would be fun to draw Rocketo Garrison (as well as Boaz) So I did this all with a brush and then colored it digitally when I got home. 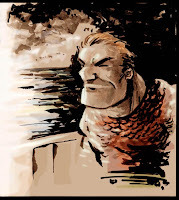 I also did Boaz, but I never took the time to add color. Perhaps I'll post him in a later blog post. Frank Espinosa has put together a great book. It has a nice mix of genre appeal where it's sci-fi and fantasy, and pirates, and high adventure, and war...Rocketo's got it all. I need to now pick up vol. 2!